While I was at the market this weekend I came across some local ramps or wild leeks which has to be the first local produce that I have seen so far this year. Ramps are a member of the onion family and taste like a cross between onions and garlic. I first came across ramps last year and I have been hooked ever since! Not surprisingly I picked some ramps up as soon as I saw them and I knew exactly what I wanted to do with them. 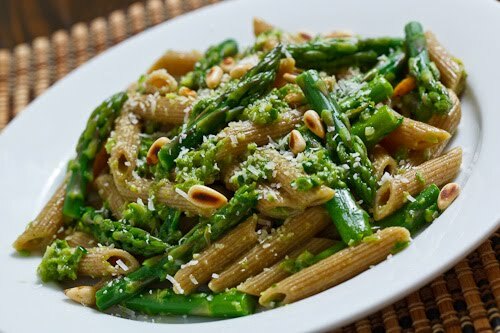 One of the things that I did with the ramps last year was make a ramp pesto and now I was thinking of combining the idea of a ramp pesto with another of my favorite spring vegetables, asparagus, to make an asparagus and ramp pesto. I kept the recipe nice and simple where I pretty much just took my recipe for asparagus pesto and replaced the garlic with 2 whole ramps for a nice kick of garlicky goodness. I tried my new pesto out in a pasta containing whole wheat penne and asparagus and it was really good! The pesto was vibrantly green, amazingly fresh and full of flavour! With this first taste of spring, I am now looking forward to the next few weeks and all of the fresh local produce that will come. Cook the pasta, drain and toss with the pesto and asparagus. Serve garnished with the pine nuts and parmigiano reggiano. Take a look at the Presto Pasta Nights roundup on Thyme for Cooking . That looks great Kevin….I never heard of ramps but they do sound quite good. Pesto, pasta, and asparagus…. 3 of my very favorite things!! And so pretty too 🙂 I've never heard of ramps either, but the sound delicious! When we were on vacation in NC last week, there were ramps in the local market. I too had never heard of them. The description you gave is basically what they told me. However….they also provided some pretty graphic descriptions of the gastric aftermath ;0 Of course, we were in "Bubba Land" LOL! Never knew about ramps. I will look for them at my farmers' market. Great idea to use a variety of greens to make pesto. This pesto sounds pretty intriguing. Looks delicious Kevin. I've been hearing about ramps – now I have to find some. Looks fantastic! All your dishes look awesome, delicious and well balanced pasta. They say that foods that come into season together taste good together and I totally agree with this! What a vibrant dish. This pesto sounds delicious combined with pasta and asparagus. I love ramps but can rarely get them locally. If you can locate fiddlehead ferns, I think they would be a nice addition to your pasta dish. I am anxious to give this a try. I'm not familiar with ramps but this dish looks delicious Kevin! Living out in the country, ramps are available for the picking. But loving asparagus as we do, I only cook it plain with a little s/p and butter – yum. I think that the ww pasta would be a little strong for the delicate fresh asparagus anyway. Homemade pasta is so much lighter (and cooks so fast!). . .
Looks fab. I discovered ramps for the first time last year and am hooked myself. I planted asparagus last year, but won't be able to harvest until next year. Only one more year of buying it! I made something similar to this the other night, a springtime carbonara with ramps and asparagus. Your dish looks great! Hi Ho. Just saw something similar on FoodTV-US. Agree that ww pasta might be too strong. Lucky you! Since – local food-wise anyway – Spring doesn't really come to Nova Scotia for another month or so. Some folks even say not until June! Thanks for sharing this dish with Presto Pasta Nights. I'll bookmark it for when we do get some. Ramps and asparagus!! How brilliant are you? This is beautiful, but I am completely envious of your ramps. I can never find them. Perhaps next weekend I will get lucky, because I am thinking this pesto would be the perfect way to use them. I am making this tonight since I bought asparagus and ramps at the farmers' market. Spring, finally! I have made asparagus pesto, but this sounds great and I have all the ingredients including whole what pasta (linguine in my case) and spinach. Your blog is amazing and it seems that 9 times out of 10 when I see something that immediately appeals to me on a food photo site, it links back to you!